What does “alive documentation” mean? Documentation is alive if it is executable by simulation, it’s non-ambiguous and can be (easily) changed as a reaction to frequent alterations. 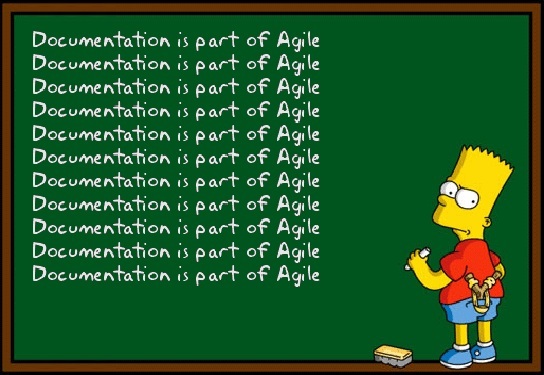 Documentation may be a drawback for agility, if we conceive it as a set of non-updated and unstructured collection of words with ambiguous meaning, because its utility is limited and usually becomes dead. In other words, we don’t need Shakespeare for documenting system knowledge. However, agility may be supported, if we are able to manage structured, concise and easy-to-update specifications that support knowledge discussion at each iteration. If we have a useful map, we will find the right way faster. What if we were able to structure system functional knowledge in models from which we could generate purpose-driven documentation that could be easily regenerated after changes? This is not the future, this is the present (watch the Recover webinar for details). Establishing a purpose-driven modeling strategy, for managing knowledge in Agile projects, is essential for enhancing the potential of many other principles of agility, specially about change (“welcoming changing requirements even late in the development”). It’s because models facilitate impact analysis and detection of early inconsistencies , in addition to reporting and estimation facilities. In summary, the claim is that “Our highest priority is to satisfy the customer through early and continuous delivery of valuable software” but we also need to add associated knowledge representations in the form of weighted models or documentation. In this way, during each iteration, the piece of working software becomes a part of the result, and this piece of documentation is integrated into the global specification view for better agility through enhanced knowledge management.